Yesterday I was forwarded an article on Balkan Insight (BI) about some of the concerns over the upcoming parliamentary elections in Albania. The author was right on the money when describing the situation and also about the potential triggers that could cause trouble as the 23rd of June approaches. I want to stay positive and hopeful about what will transpire in the coming days but if past elections are to be taken into account then something is to be expected! The issues presented in the BI article have been talked and discussed at length in the local media, but I wanted to point it out for the benefit of English language readers. 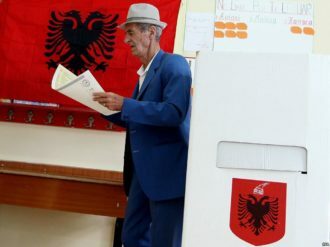 “Though Albania has a history of dubious elections, the upcoming polls are fraught with new tension pitting rule of law against the need to hold elections. Previous articleAn “Olive Garden” Albanian style! Next articleAlbanian PM admits defeat and resigns his post as head of DP!